Also of note this week is the myriad of examples of Trump distancing our country from our traditional allies, and instead cozying up to brutal authoritarians. Human rights abroad are no longer a priority — the focus seems to have shifted to where the Trump organization has properties. Trump’s attorney said he wouldn’t sign his 2016 financial disclosure, a major departure from the norm. After OGE pushback, Trump said he would sign, but has yet to do so. The WH also blocked disclosure of names of former lobbyists who have been granted waivers to work in the WH or for federal agencies. Late Friday, the WH said they would comply, but has yet to do so. GOP Senators are considering changing rules to make it harder for Democrats to block Trump’s picks for circuit court judges. This follows the “nuclear option” which eased the path for Trump’s SCOTUS pick. Tillerson held a press conference in Riyadh on a new US-Saudi partnership. US media was excluded. NPR reported there’s been an unprecedented spike of white supremacist activity on college campuses since Trump was elected. Shortly after announcing his resignation from Congress, Jason Chaffetz said individuals leaking info to the press should go to jail. Trump considered vetoing the temporary spending bill. Priebus asked John Boehner to talk Trump into signing and keeping the government open. As the Trump regime’s visited Saudi Arabia, the kingdom announced it would invest $20 billion in Blackstone’s new $40 billion infrastructure fund. Saudi Arabia will also invest $100 million in Ivanka’s Women Entrepreneurs Fund. In addition to other human right’s abuses, the kingdom has one of the worst records globally for treatment of its women. FP reported that Israel changed its intelligence sharing with the US after Trump’s leak to Russia. Turkey summoned the US envoy to complain about the treatment of Erdogan’s bodyguards for beating up US protesters. Amid rising tensions, Turkey signed a $1.5 million contract with longtime Trump lobbyist Brian Ballard. Ballard’s firm has also recently signed contracts with the Dominican Republic and the Socialist Party of Albania. A leaked transcript prepared by the Philippines government of a phone call between Trump and Duterte described Trump praising the brutal authoritarian: “what a great job you are doing” with the drug problem. Also on the call with Duterte, Trump revealed the location of two US nuclear submarines. US officials were chastised for leaking the identity of the Manchester bomber to the press before British police officially named him. UK officials were also outraged when photos of the debris surfaced in the NYT, and said they would stop sharing information about the attack with their US counterparts. Later that day, sharing reportedly resumed. Flynn’s lawyer said his client would invoke his Fifth Amendment rights rather than comply with a Senate Intel Committee subpoena. Sen. Burr and Warner said they are considering holding Flynn in contempt. Christie told reporters that as head of Trump’s transition team, he told Trump not to hire Flynn in any capacity. Pence took over as head next. Sessions canceled his Monday testimony on DOJ funding before Congress, for fear the hearing would be overtaken by questions are the Trump-Russia scandal. Rep. Elijah Cummings said the House Oversight Committee has documents that show Flynn lied to security clearance investigators in 2016. Flynn claimed he was paid by “US companies,” not Russia’s RT, for his 2015 Moscow trip. CNN reported that Mueller visited FBI headquarters, and was briefed on the contents of Comey’s Trump memos. WAPO reported Trump asked intel chiefs Daniel Coats and Michael Rogers to publicly say there was no collusion between Russia and Trump in the 2016 election. The goal was to “muddy the waters” about the FBI probe. Like Comey, Rogers was concerned about his conversations with Trump, and kept contemporaneous notes. WAPO also reported that WH staffers tried to get senior intel officers and members of Congress to push back on the stories that the Trump regime members were in frequent contact with Russian officials. Sen. Tammy Duckworth sent a letter to the NSA requesting info on security sweeps of the Oval Office after Trump’s meeting with Lavrov and Kislyak. A member of the FEC called for an investigation into Russia’s purchase of Facebook ads to possibly boost Trump in the election. Brennan also said he alerted the FBI about the troubling pattern in July, seeming to form the basis for the start of the FBI investigation. Despite the Trump’s regime efforts to limit the scope of Mueller’s investigation — citing Kushner, Ivanka and Manafort are clients of his former law firm — the DOJ cleared Mueller to lead the Russia probe. The Senate Intel Committee subpoenaed two Flynn companies. Businesses, if corporations, cannot plead the Fifth. On Thursday, the Senate Intel Committe voted to give Sens. Burr and Warner blanket authority to issue subpoenas in the Trump-Russia probe. Burr and Warner asked Trump’s political organization to produce all Russia-related documents, emails and phone records going back to his campaign’s launch in June 2015. STAT reported on experts citing that the deterioration in Trump’s linguistic capabilities could reflect changes in the health of his brain. Infowars was given WH press credentials. The NEH chairman resigned amid Trump’s budget rollout which calls for huge cuts to domestic programs. A top Education Department official resigned after refusing DeVos’ orders to testify before a congressional oversight hearing. Trump’s Caribbean estate was quietly put on the market at a significantly higher price than he paid in 2013, again raising ethical concerns of potential buyers paying above market to gain access. NYT reported on ethical concerns over the Trump family golf business, as the PGA comes to Trump National. Access to Trump, who frequents his courses, is being touted as a marketing point for membership. Demonstrating how Trump’s friends continue to influence policy, Carl Icahn is set to save $60 million for his oil refinery company CVR Energy in the first quarter due to planned easing of regulations. Giuliani attempted to distance himself from Trump’s Muslim ban, despite his bragging on Fox News months ago that he was consulted by Trump. DeVos said states should have the flexibility to discriminate against LGBTQ students, and schools will not be at risk of losing federal funds. Although before taking office Trump promised to donate all profits earned from foreign governments back to the US Treasury, according to NBC, the Trump Organization is not tracking these payments. The Constitution bans presidents from receiving foreign government gifts. 93% of key roles in the executive branch remain unfilled. BuzzFeed reported the guest reception manager at Mar-A-Lago, wife of a twice-convicted felon who likes to brag about his wife’s access, was assigned a WH email and phone and helped with Trump’s overseas plans. A new study found that tourism to the US has been on the decline since Trump took office, dropping by as much as 16%. The Carrier plant in Indiana, where to much ballyhoo Trump showcased saving 800 jobs, announced mass layoffs before Christmas. The jobs are being moved to Mexico. At the NATO summit in Brussels, Trump pushed the PM of Montenegro aside, before chastising participants for not paying their share of NATO costs. His behavior was met with uniform disgust by our allies. Trump also refused to clearly back Article 5, the one-for-all, all-for-one principle of NATO, and remained at odd with our allies over Russia. Aya Hijazi, who Trump had bragged about negotiating her release from an Egyptian prison, told PBS’s Judy Woodruff that Trump did not understand that it was el-Sisi’s regime that held her. On Wednesday, Greg Gianforte, running for Montana’s open Congressional seat, body slammed a reporter when asked about AHCA CBO scoring. Like Trump, Gianforte has had harsh rhetoric on the media. Gianforte was charged with assault the night before the election. Weeks before Jacobs had reported on Gianforte’s ownership of Russian index funds, whose holdings include companies like Rosneft which are under US sanctions. Press advocates cited four incidents between the press and public officials in the past month, saying Trump’s rhetoric has led to a “climate of anger, disrespect and hostility” towards the press. Politico reported that Trump reached out to former campaign staffers Corey Lewandowski and David Bossie about becoming crisis managers as the Trump-Russia scandal unfolds. In a surprising move, Trump hired his longtime personal lawyer Marc Kasowitz to represent him in the special counsel’s Trump-Russia probe. CNN reported the Trump regime is establishing a war room-type operation aimed at developing a rapid-response to Trump-Russia news. As the CBO came out with alarming scoring on Trumpcare/AHCA, Trump ally Gingrich called for the abolishment of the CBO. Trump’s budget targets undocumented immigrants by denying them tax credits and jobs, while significantly beefing up his deportation force. The Trump regime kept US reporters largely in the dark during his overseas trip this week: delaying readouts, keeping reporters at a distance, and refusing to hold new conferences. Trump ally Sheriff David Clarke directed his staff waiting at the terminal to hassle a plane passenger after a brief exchange. The passenger is suing Clarke and his deputies involved. In their efforts to highlight crimes committed by undocumented immigrants through their VOICE program, Trump’s DHS published a database with the personal information of abuse victims. For the first time in almost two decades, Tillerson declined to host a Ramadan event at the State Dept. In Portland, OR, a suspect hurled insults at Muslim women on a MAX train, before stabbing men who tried to stop him. Two are dead. According to the DOJ, Sessions did not disclose his meetings with Kislyak in his security clearance application. Sessions remains AG despite having lied both to the Senate under oath and on his security clearance application about Russia, as well as playing a role in Comey’s firing despite being recused on Trump-Russia matters. Members of the House Financial Services Committee asked Deutsche Bank to produce documents on Trump family loans. As mentioned in Week 18’s list, Deutsche has been fined for laundering money for Russia. NYT reported that US spies collected info last summer that top Russian officials were discussing how to exert influence on Trump through his aides, Manafort and Flynn. Politico reported that despite the Trump spin that Manafort was a minor player and not in touch with his regime, Manafort called Priebus the week before the inauguration to discuss the growing Russia scandal. WAPO reported that a fake Russian document which claimed assurances from AG Loretta Lynch to the Clinton campaign on the email investigation, influenced Comey’s handling of the investigation, including his unusual news conference in July without conferring with the DOJ. Although Comey had the Russian document for months before the July news conference, the FBI did not take the simple steps needed to prove it to be bad intelligence until after July. WIRED reported that Russian hackers are weaponizing “tainted” leaks — planting altered materials with disinformation alongside legitimate leaks. WSJ reported that a GOP political operative, Aaron Nevins, worked with the Russians to hurt Clinton and Democrats during the election — the first direct evidence of collusion. WAPO reported that the FBI “person of interest” in the WH referenced in their reporting last week is Kushner. The FBI is investigating Kushner for the extent and nature of his contacts with Russian officials. Further, WAPO reported the FBI is investigating possible coordination between the Trump campaign and Russia to influence the 2016 election, as well as possible financial crimes. The FBI informed House Oversight Committee chair Chaffetz that they will not turn over Comey’s memos, leaving open the prospect that Mueller is investigating Trump for obstruction of justice. Joe Lieberman became the fourth candidate under consideration by Trump for FBI director to withdraw from consideration. After demurring on whether Trump would lift sanctions on Russia Thursday, a top Trump adviser, under media scrutiny, said Friday the sanctions would remain in place. A Quinnipiac poll found that most Americans believe Trump is abusing his power (54-43), and most believe he is not honest (59-36). WAPO reported at a meeting at Trump Tower in early December, Kushner proposed to Kislyak setting up a secret communication channel between the Kremlin and the Trump regime using Russian diplomatic facilities. Kislyak was reportedly taken aback by the suggestion, and concerned Kushner’s request would expose Russian communication capabilities. Kushner’s goal was to avoid US intelligence monitoring. Flynn attended the meeting with Kislyak too. Of note, both Kislyak and Flynn secretly met with a UAE crown prince around the time that prince was setting up a meeting between Erik Prince and a Russian official in Seychelles (see Week 21’s list). Trump met that same UAE crown prince at the WH last week. Reuters reported that Kushner had at least three previously undisclosed contacts with Kislyak during and after the 2016 presidential campaign. Reuters reported FBI investigators are examining whether Russians suggested to Kushner or other Trump aides relaxing US sanctions in exchange for making bank financing available to the Trump regime. Russian oligarch Oleg Deripaska has offered to cooperate with Congress in their investigation of Manafort in exchange for immunity. Noted in Week 27, Deripaska is suing AP for libel for reporting his ties to Manafort. The owners of Russian Alfa Bank, Mikhail Fridman, Petr Aven, and German Khan, sued BuzzFeed Friday in state court in Manhattan for publishing the Steele dossier. Amidst the Trump-Russia turmoil, Trump canceled his Iowa campaign rally scheduled for next week. 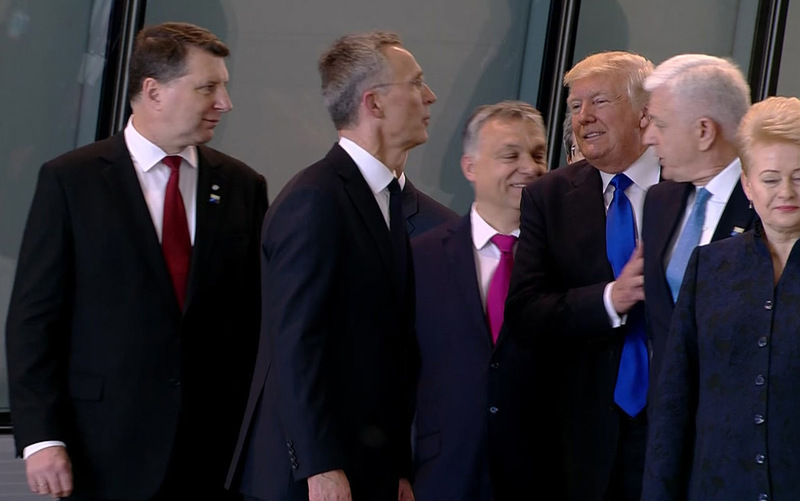 Trump shoves aside Montenegro’s PM at the NATO summit in Brussels.